To create the elephant book I travelled to Africa and India. In Africa, I met my guide in Amboselli and followed herds of elephants each day. Then I flew in a tiny plane to Samburu where I spent many hours and a few heart-stopping moments with elephants by the river. Next, the open grasslands of the Maasi Mara where some elephants were gentle, some cranky, some let me get close and others charged the jeep. Doing my homework and having a good guide is very important when I’m creating a book. And, it keeps me safe! I had special permission to go into the bush with a guide to see the orphaned baby elephants at the David Sheldrick Trust orphanage. It was a wonderful experience. At Kipling Camp, in India, I was fortunate to ride a famous elephant called Tara. Each day we went into the forest and then down to the river where I washed her with a big stone. 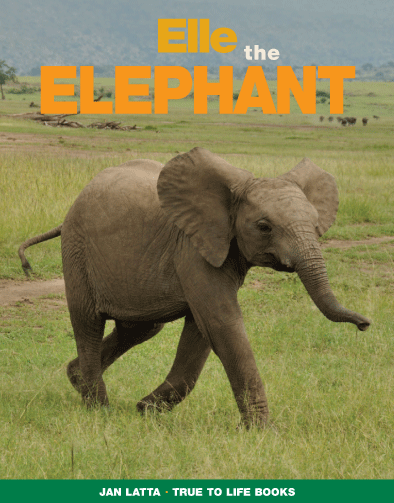 The concept for the book is the elephant talking to children about its life in the wild and how it can survive. There are maps, interesting facts and fun activities. See this video of elephants in the wild.